My tattoo idea started out with my fascination of the supernatural and the paranormal. I wanted to have my theme as realistic as possible. While going through countless books, magazines, art and history books, trying to get some kind of idea, it all of a sudden came to me. Why don't I incorporate the entire Bachelors Grove cemetery as the backdrop of my tattoo! With that in mind, my husband Kevin and I went out to Bachelors Grove one Fall afternoon, along with my Tattoo Artist Penny Schuhrke. After some more brainstorming of how I wanted my back piece to look, Penny went to work. She started taking pictures of all the headstones as well as all the grass and vegetation, trees, landscape, etc,. I wanted to use the Fulton headstone for the centerpiece of my Muriel. After a couple of weeks, Penny put together the final drawing and layout of my back piece. It was everything that I could have imagined and more! Penny really put a lot of thought into each and every detail. My Tattoo was done over a period of six months. The work was started in December of 2005 and was completed in late May of 2006. Each weekend I would go in for my weekly sitting, which usually lasted anywhere from five to seven hours. You really have to have patience for work of this size. Tattoos of this size take a very long time to complete. You really must be dedicated to the work that needs to be done to complete something so big. Not only myself, but my Tattoo Artist Penny as well. She put in countless hours of dedicated work, and I am forever grateful for that! I feel like the tattoo represents so much. Everything from the beautiful Harvest Moon, to the tall grass that sways in the shadows. And of course you cannot forget the witch sitting on top of the "Fulton" headstone! She is holding an orb of white light for protection. I think Penny and her amazing talent put together exactly what I was trying to capture. I feel that my back Muriel gives life to a cemetery that is always shrouded in darkness. 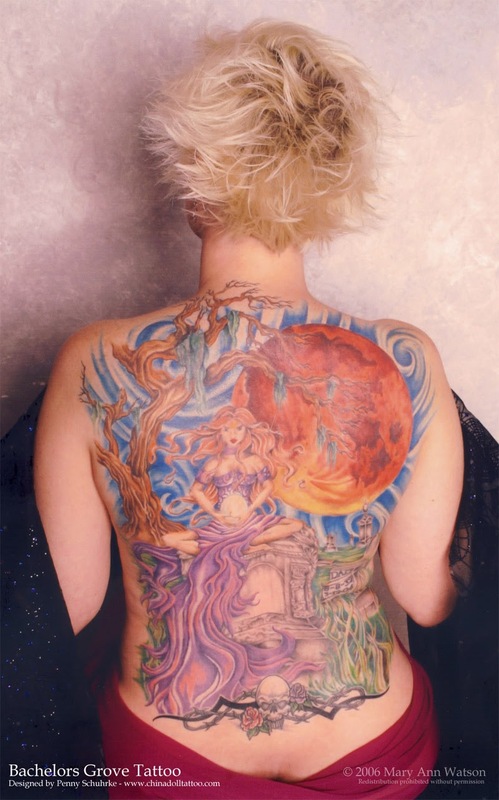 I truly have a one-of-a-kind portrait tattooed on my back. Bachelors Grove to me has always been a peaceful place. It's a beautiful place to visit, not just for the supernatural, but for all of its historical beauty! Hopefully I have captured some of that beauty and serenity, and preserved it on a Muriel that I wear proudly each and every day! The photograph below was signed by Kevin and Mary Ann and given to Pete Crapia of www.bachelorsgrove.com. It now resides in the archives at the Tinley Park Historical Society, Tinley Park, Illinois.